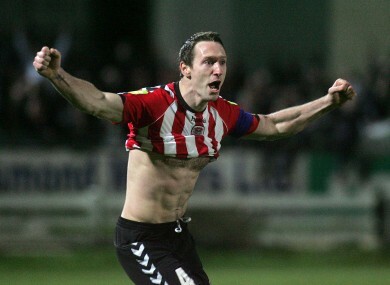 Derry City's Barry Molloy celebrates at the Brandywell last night after scoring against Linfield. 1. #MESSI MILESTONE The ‘little flea’ has overhauled a 67-year-old record to become Barcelona’s top goalscorer of all time. The Argentine scored his 232nd, 233rd and 234th goal for the Blaugrana last night as they beat Malaga 5-2 and closed the gap to Real Madrid at the La Liga summit to five points (wanna see the goals?). Messi has broken Cesar Rodriguez’ long-standing landmark and is well on course to break Barca’s all time striking record of 369, set before the formation of La Liga by Paulino Alcantara. 2. #SECTARIAN STORM The GAA are being faced with claims of ‘racism’ after Armagh complained of ‘partitionist provocation’ which led to captain Ciaran McKeever being sent off during Sunday’s national league defeat to Laois at O’Moore Park on Sunday. 3. #PREMIER LEAGUE James McClean’s best efforts proved to be in vain last night as Sunderland fell to a 2-0 defeat to Blackburn at Ewood Park. The result lifts Steve Kean’s side six points clear of the relegation zone. QPR are one of the four teams below them and they will be out to close that gap at home to Liverpool tonight. All eyes though, are likely to on the top of the table where Manchester City host Chelsea hoping to reduce the gap to Manchester United to the minimum. Carlos Tevez could be in line for a long awaited return to help with the title push. Elsewhere, the race for the Champions League continues as Everton host Arsenal and Stoke travel to London to meet Spurs. You can read all the previews here. 4. #SETANTA CUP The Airtricity League will provide three semi-finalists for the inter-island competition. Derry City recorded a 3-1 win over Linfield and a draw was enough to take Sligo Rovers past Glentoran on aggregate. Shamrock Rovers lost 2-0 on the night but saw off Cliftonville 3-0 on penalties. Bohemians crashed out at the hands of Crusaders. 5. #WHITES RINSED Leeds United were embroiled in an incredible game in the Championship as they lost 7-3 at home to Nottingham Forest. Astonishingly, the Yorkshire side not only took the lead, but were level with Forest at 3-3 before the visitors scored four without reply in the final half hour. It is the first time Leeds have conceded seven goals at home. 6. #NEW GAFF Minister for sport, Leo Varadkar, yesterday announced plans for a €19 Million development of the National Sports Campus at Abbottstown. The GAA, IRFU, FAI and hockey’s IHA will all benefit from the campus and the development will begin this September. You can read all the details of that one, here. 7. RIP The outpouring of grief for the late Jim Stynes continues today on both sides of the world. This moving tribute from, ex-Clare hurler, Tony Griffin is well worth a read. Email “The Morning Score: Wednesday”. Feedback on “The Morning Score: Wednesday”.